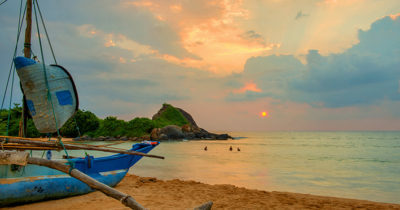 Shinagawa Beach by Asia Leisure is a 26-room luxury boutique hotel situated on a sparkling stretch of sandy, palm-fringed beach in the coastal town of Balapitiya. It is a spellbinding experience, promising rest, relaxation and complete luxury amidst a one-of-a-kind beach and inescapable views of the deep blue ocean. Shinagawa Beach is a member ofthe exclusive Small Luxury Hotelsof the World and has also beenrecognized as an International 5Star Hotel for the year 2016-2017by the International Hotel Awards.It was previously recognized as theBest Small Hotel in Sri Lanka at the Asia PacificHotel Awards for 2014-2015”, said Asia Leisure CEO Reyhan Morris. SHINAGAWA BEACH provides 24 deluxe roomsand two suites with sweeping views of the IndianOcean, private balconies and high-speed Wi-Fi.Deep soaking bathtubs, rain showers and soft duvetsto sink into ensure deep comfort whilst thesuites come equipped with Bose sound systemsand espresso machines.